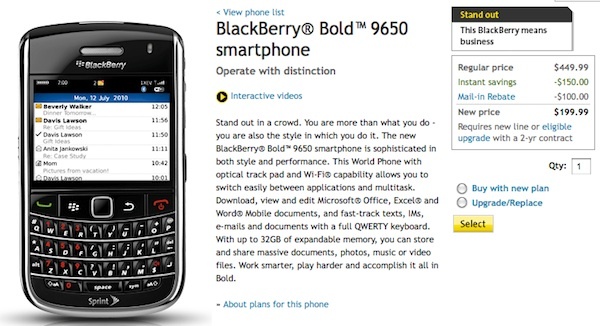 Today, Sprint has officially announced that they will be carrying the BlackBerry Bold 9650 and will start selling today on their website. The 9650 will run you at $199.99 when signing a 2 year term after $100 mail-in rebate. No information on what stores have them or if they even do but expect quite a few stores to be sold out if they do. love my new 9650. keyboard is great, way better than my old phone. me and my girlfriend got both 2 and they are great for facebook and apps. games keeep us busy and texting is a breeze on this. great unlocked phone. way better than my old one. the track pad is way better than the old track ball on my old phone. i miss the touch screen but i like this got my last 2 at gsmallover.com and we love them. by far my favorite unlocked blackberry phone so far. I’m very pleased with all the articles on your site. I recieve a great number of tips to help me. I’m executing something of the identical interest and will be having note on this .Thank you.